This Spring DataCenter moved offices after 17 years at the same location in downtown Oakland. We reviewed hundreds of boxes of DataCenter newsletters, reports, administrative records, and publications. We culled through our archives and sent 35 boxes to UC Berkeley’s Bancroft Library, adding to DataCenter’s 280 carton archive housed there. In March, we held a photo party, bringing together past DataCenter staff to go through boxes of pictures and label them so they could also be added to the archive. DataCenter’s archive was first transferred to Bancroft in 1998. 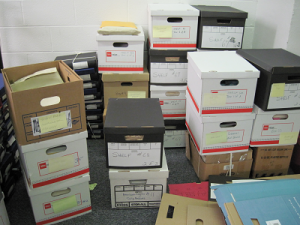 The archive, in addition to DataCenter’s publications and administrative records, includes over 800 posters, alternative magazines, publications, and files on a range of topics including social justice movements and corporate malfeasance. Fred Goff, co-founder and former Executive Director of DataCenter, maintained daily logs for many years, which are included in the archive. Also transferred to Bancroft is North American Congress on Latin America’s (NACLA) archive. DataCenter emerged from NACLA in 1977. DataCenter sent some material to other locations as well. Rini Templeton, an incredible graphic artist whose drawings have been used by activists, primarily in the United States, Mexico and Central America, had a close relationship with DataCenter for many years. We sent our assembly of her drawings to UC Santa Barbara’s California Ethnic and Multicultural Archives (CEMA) which holds a Rini Templeton collection. We sent posters by Clayton Van Lydegraf, a political activist based in the Pacific Northwest, to the Clayton Van Lydegraf archive at the University of Washington Labor Archives. Archivist and activist poster expert Lincoln Cushing received the rest of DataCenter’s poster collection. Read Lincoln’s account of the poster archiving process here.